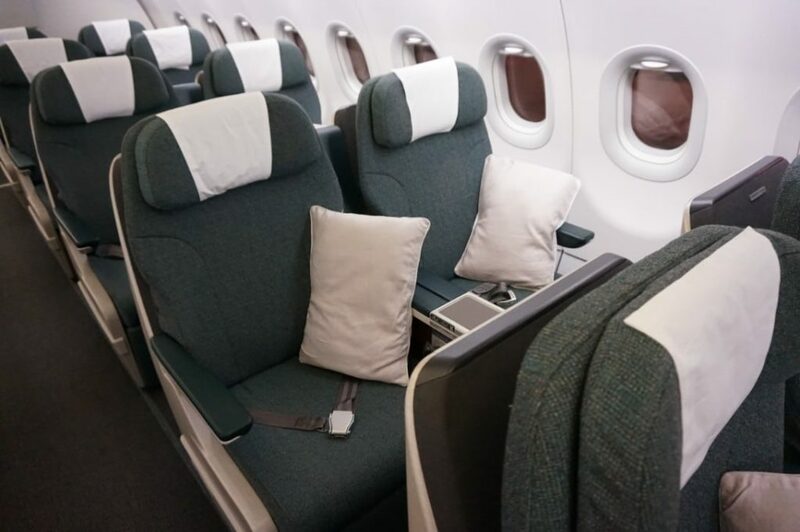 I’ve reviewed SilkAir’s Business Class before so I don’t want to do another standalone review, but I bring it up because I think it’s worth comparing Cathay Dragon to SilkAir. They’re both regional subsidiaries, they both serve lower-traffic destinations and they’re both (generally) considered the poorer cousins of their more illustrious parent carriers. That said, I found the Cathay Dragon experience to be much superior to SilkAir’s in terms of both hard and soft product. To be on the safe side (and having learned lessons from my last mistake fare), I’d budgeted 3 hours for the connection in Hanoi. 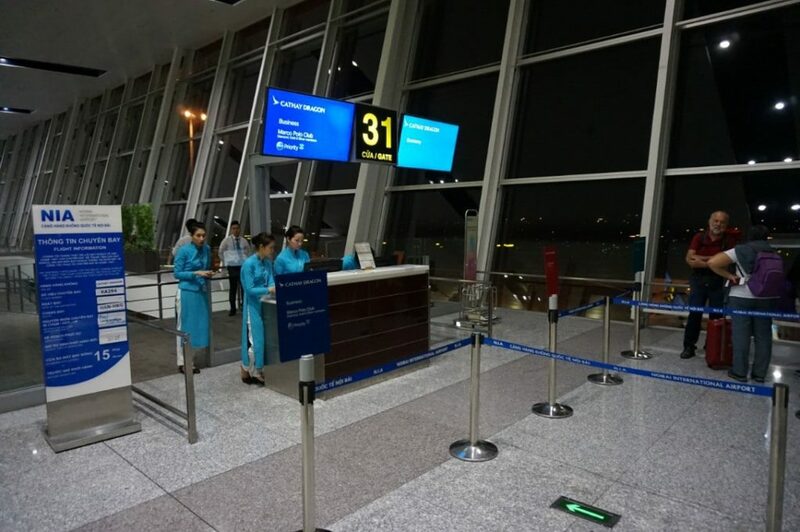 It turned out to be more than enough, because the SilkAir flight arrived on time and we already had our boarding passes for the onward flight. All in all, I’d say we were off the plane, through security and into the ACV Business Lounge within 20 minutes. Boarding was at Gate 31, just a short walk away from the lounge. 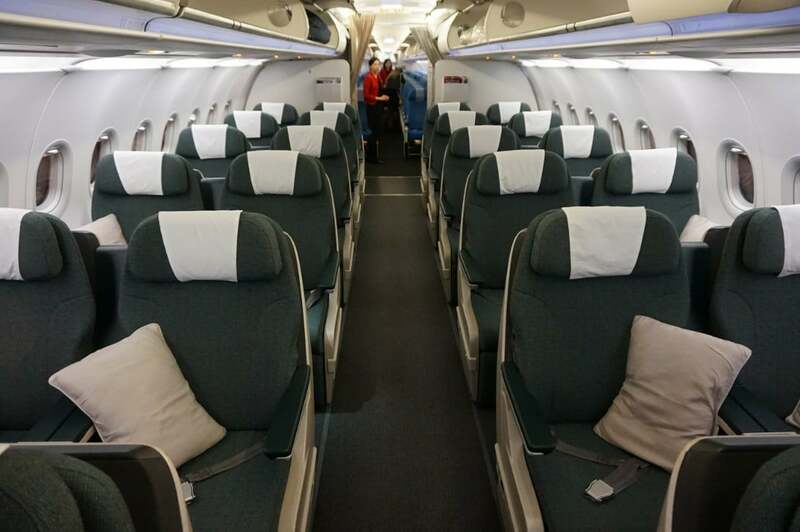 Unlike SilkAir, Cathay Dragon operates a mixed fleet of narrow and widebody aircraft. All in all, they have 25 A330s, 15 A320s and 8 A321s. 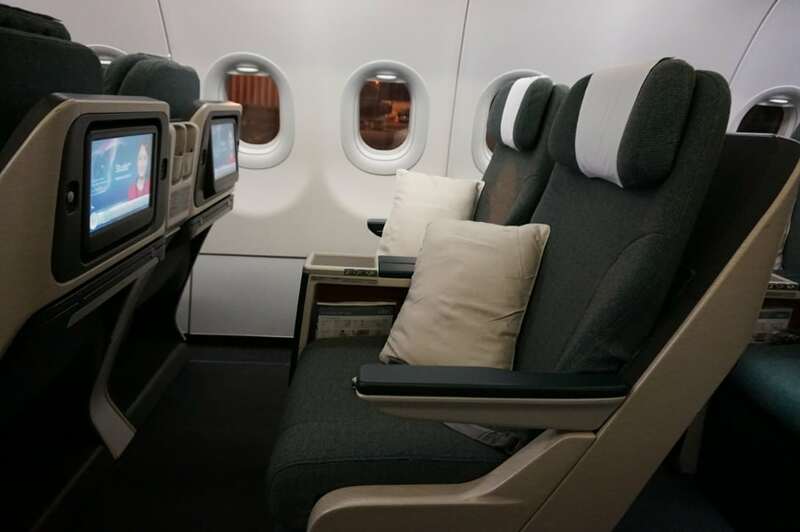 Today’s flight was on an A321, which is equipped with a 2-2 configuration in Business Class. 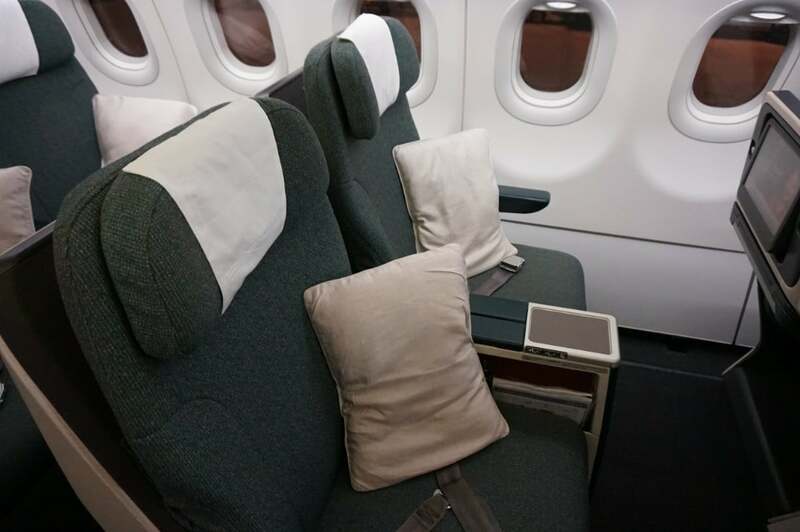 This aircraft features Cathay’s Regional Business Class seat, which was introduced in 2013. This is a modified Recarro Comfort Line 5510 seat- a recliner, but as AusBT notes, it borrows some elements from an angled-flat seat. For example, the seat has a fixed shell design, which means that reclining your seat causes it to slide forward, not intruding on the space of the person behind you. The seat is 21 inches wide with about 47 inches of pitch, and each seat has a 12.1 inch IFE screen and fully electric seat controls. 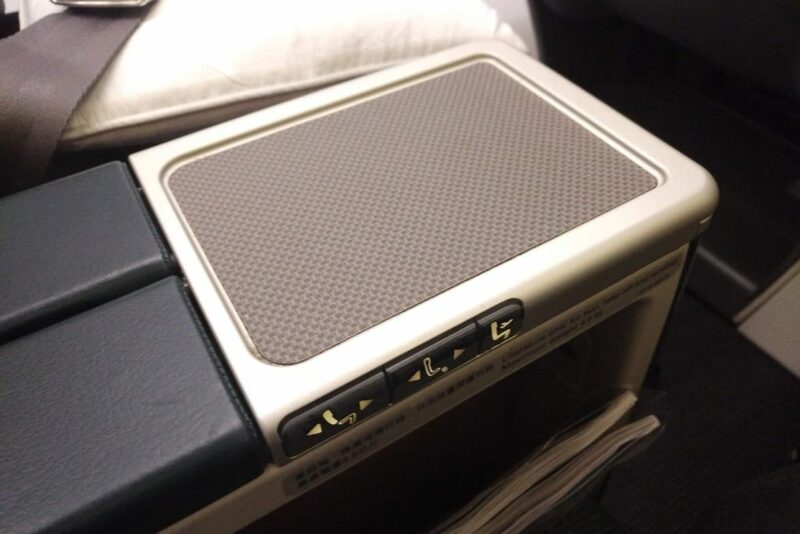 Cathay Dragon’s regional seats won’t win any awards for luxury, but they’re still head and shoulders above the ageing recliner seats you find on SilkAir’s fleet. SilkAir’s recliners are really, really old. 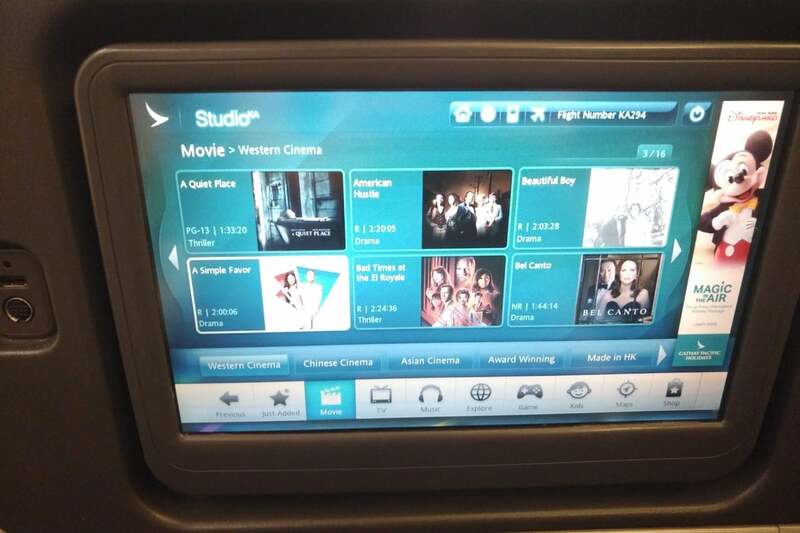 They have no built-in IFE (instead, the crew pass out iPads in Business Class to watch streaming movies), they use manual seat controls, and they’re actually surprisingly uncomfortable to sit in for prolonged periods. I think part of that has to do with the ergonomics of the SilkAir seats. Your neck doesn’t get a lot of support, and the footrest is too short and awkwardly terminates just a few inches off the cabin floor. Both the Milelioness and I had very bad neckaches and leg cramps after disembarking. 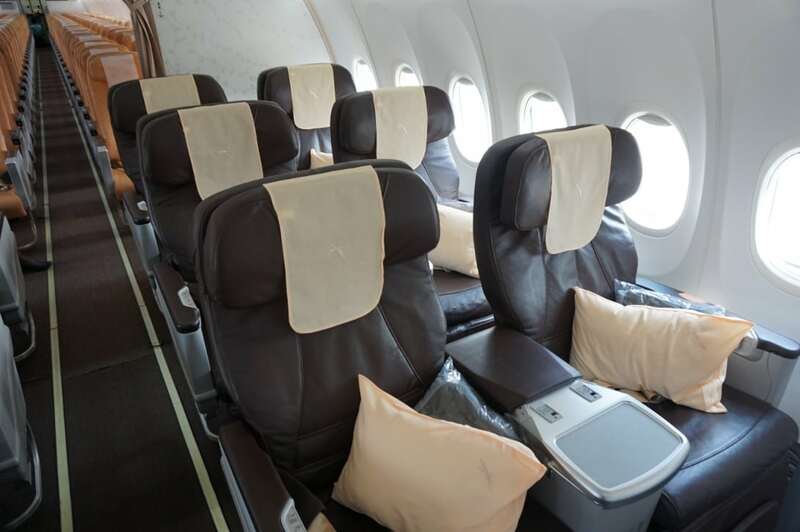 It’s worth noting that SilkAir has a slightly more modern Business Class recliner, but that’s only featured on their (now grounded) six B737 MAX 8 aircraft. 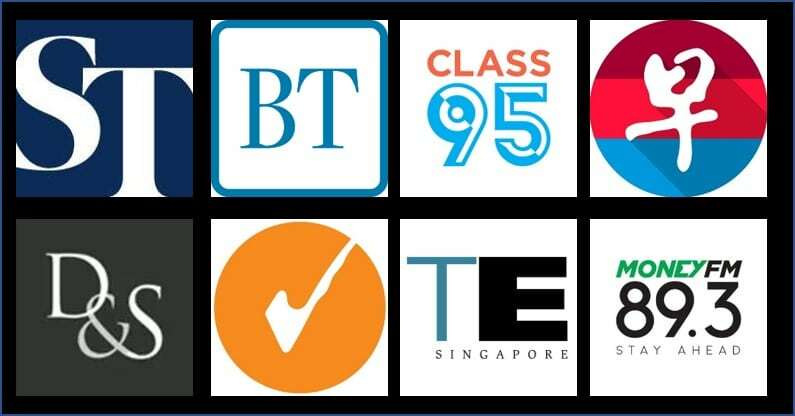 I’m also aware that it’s just a matter of time before SilkAir is absorbed into Singapore Airlines, and when that happens there’ll be an all new, full flat Business Class seat for its narrowbody planes. As it stands, however, the current SilkAir Business Class seat is a tired relic from the early 2000s, and unfit for purpose. 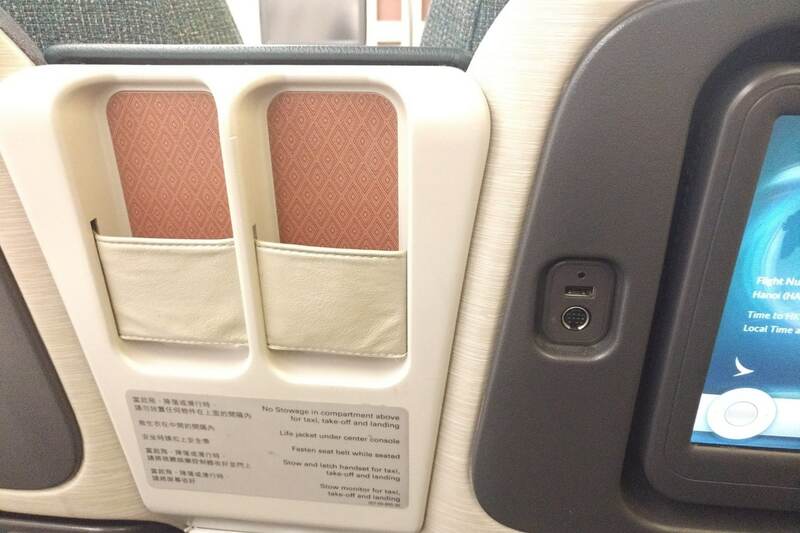 Back to the Cathay Dragon seat, and another great feature is that there’s actually in-seat storage. 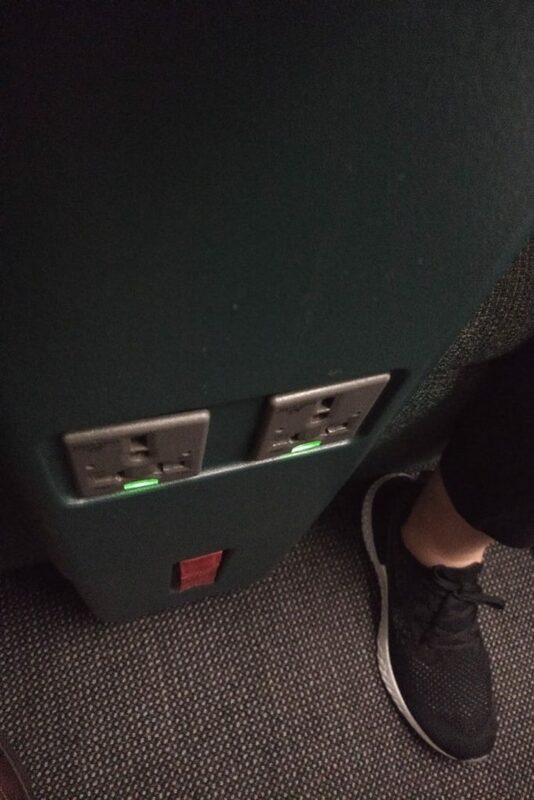 You can charge your phone in a dedicated phone slot in front of you, and you can slot your laptop into a little nook by your side when it’s not in use. Your tray table slides out from beneath the IFE screen and unfolds towards you. 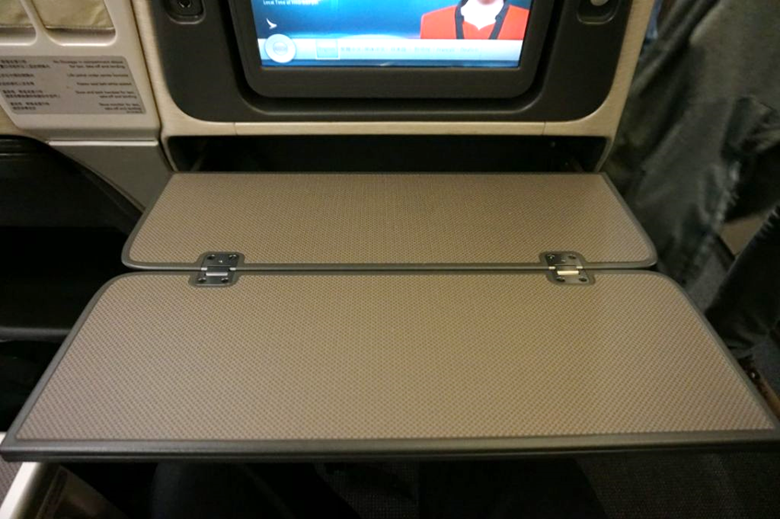 The tray table’s construction is really solid, with very little give even when pressed on hard. In contrast, the SilkAir seats had very flimsy tray tables that made typing on a laptop near impossible. 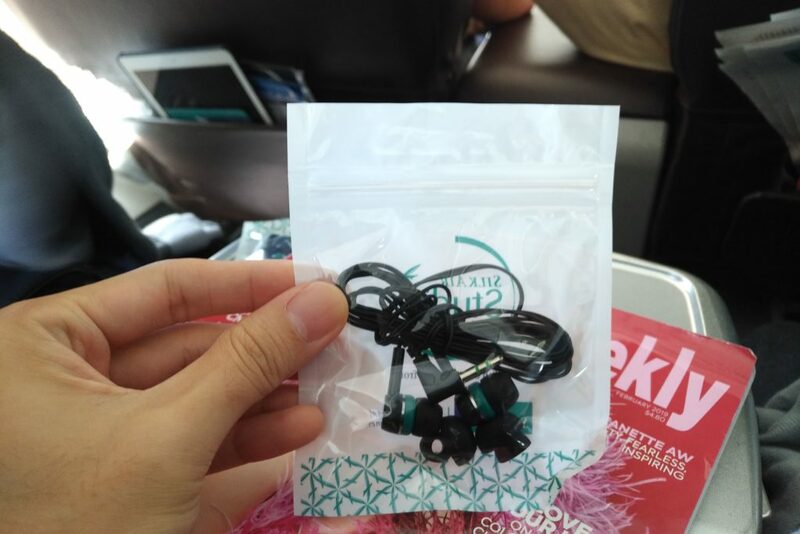 …a vast improvement on the flimsy, cheap (probably) disposable earbuds we received on SilkAir. There’s a shared central cocktail table, where you also find the fully electric seat controls. Lifting the centre divider unveils the IFE remote. The IFE screen is anyway touch sensitive, so I didn’t end up using this much. 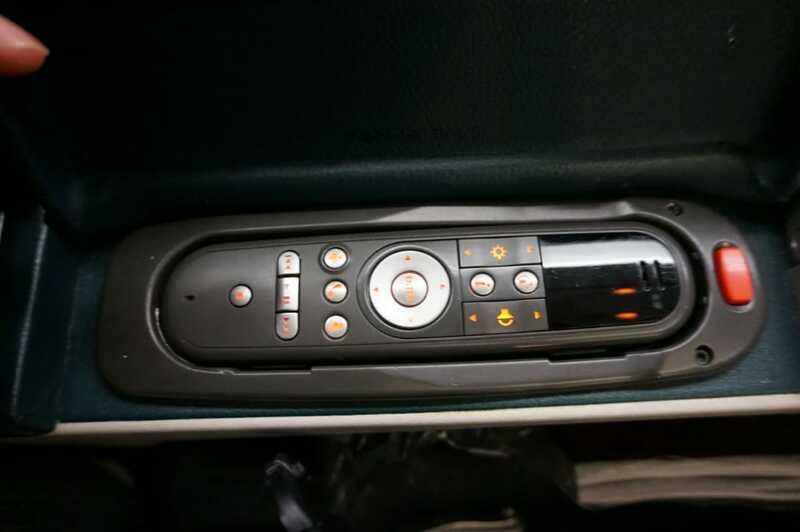 Of course there is also in-seat power, which to be fair SilkAir also had. Cathay Dragon didn’t do a hot towel service on this flight (I’m not sure if it’s because of the short duration, or just a Cathay Dragon thing). 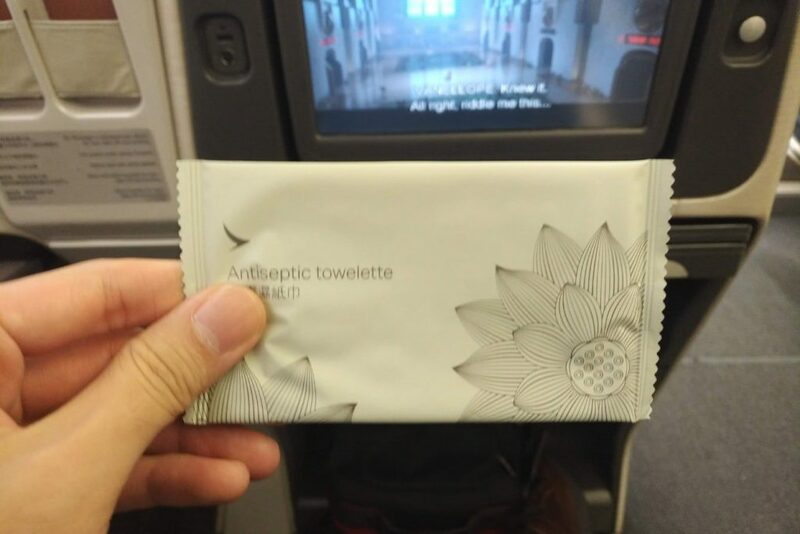 Instead, the crew passed out individually-wrapped antiseptic wet towels. Welcome drinks were also served. Champagne was available, but for something a bit different I thought I’d try the Dragon Sunrise, which is a combination of gin, fresh guava and lemon juice. 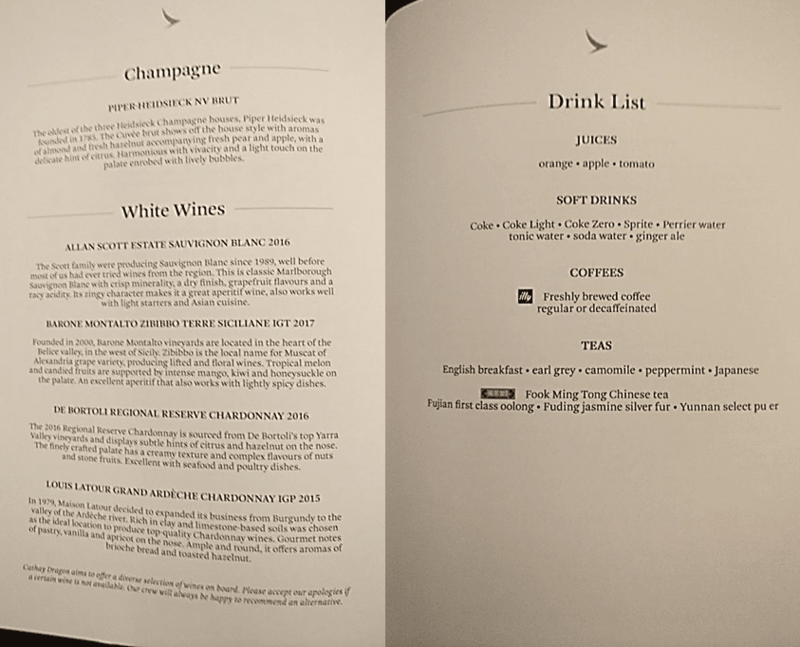 On shorter flights, Singapore Airlines no longer provides full menus. For example, on flights to destinations like Hanoi and Bali, you get a single piece of flimsy paper. 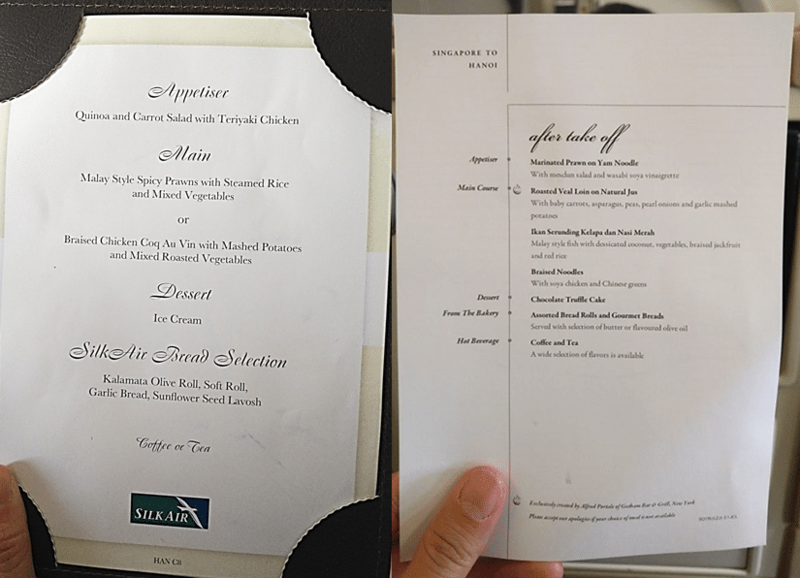 On SilkAir flights, the crew carry around a menu card and present it to the passenger just before ordering. 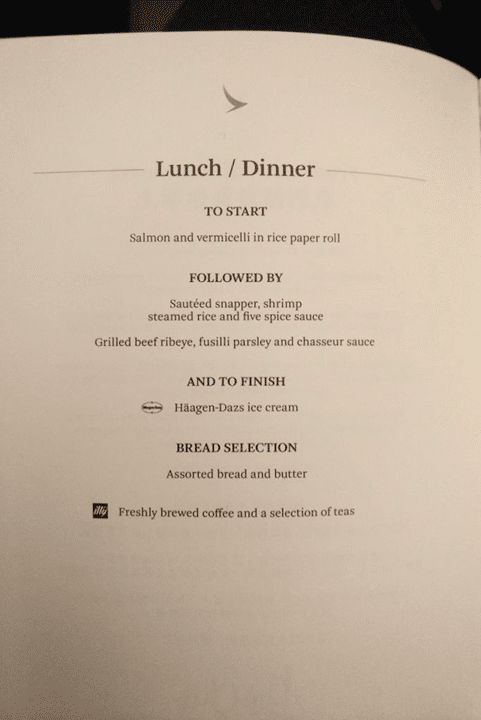 I was therefore pleased to see that Cathay Dragon still distributed proper menus before takeoff. 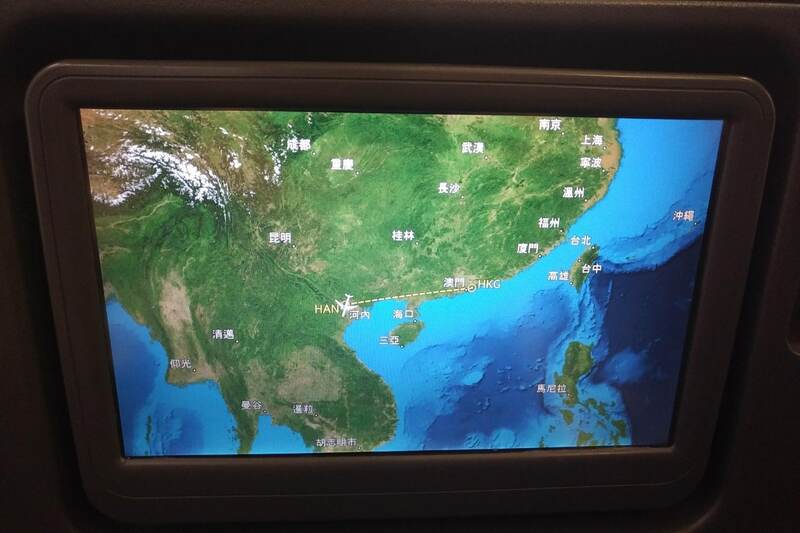 The captain came on the PA to announce the flight time of just under 2 hours between Hanoi and Hong Kong. We were, unfortunately, delayed due to the late arrival of the aircraft from Hong Kong. This would eat into the time we had in the Cathay First Class lounges in HKG. 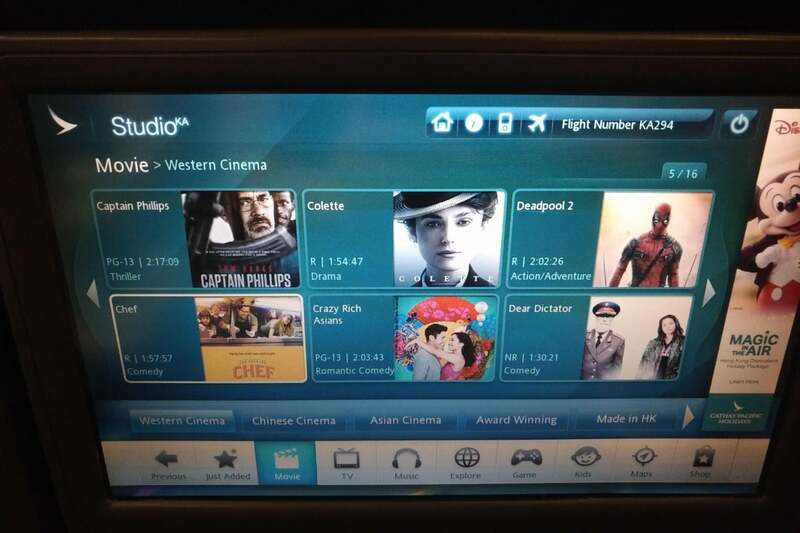 I browsed through the IFE selection as we pushed back and taxied. 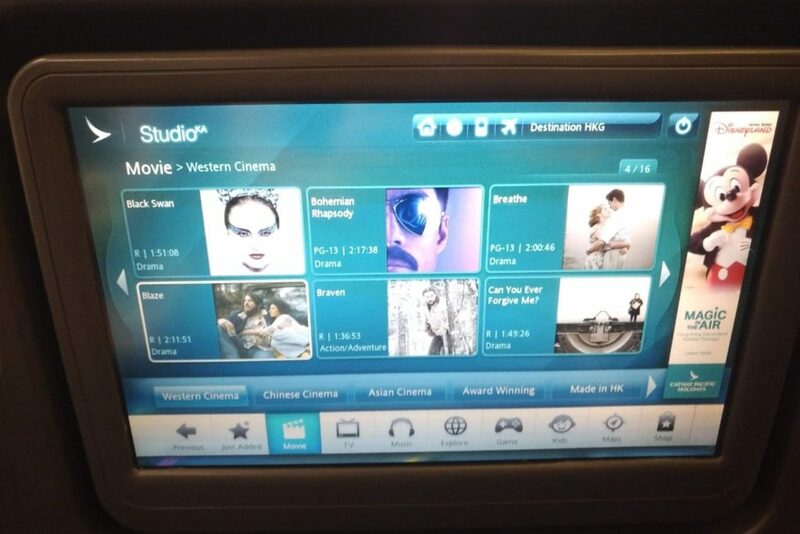 The movie selection was actually smaller than SilkAir’s streaming selection, and the movies tended to be older too. It was certainly more than sufficient for a 2 hour flight, but still something to take note of. 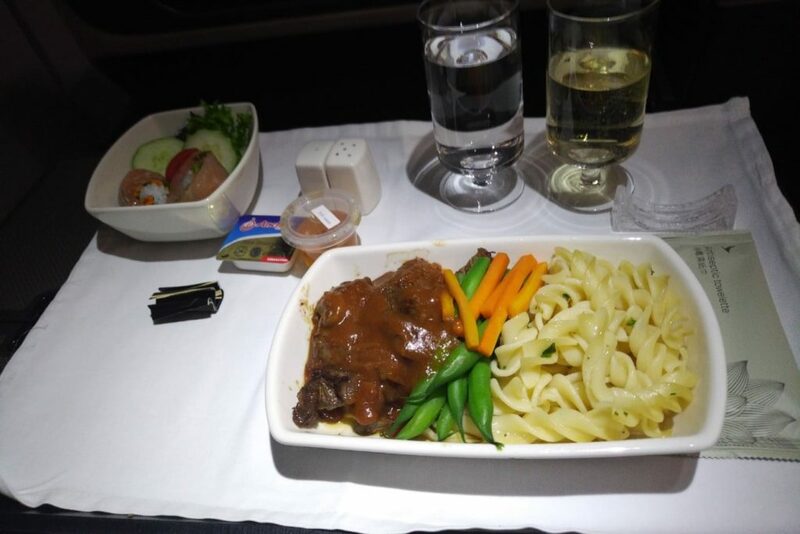 Dinner was served almost immediately after takeoff, a choice between snapper, shrimp and rice or beef ribeye with pasta. We ordered one of each, and both dishes were perfectly edible. On the SilkAir flight from SIN-HAN, they ran out of champagne 30 minutes into the flight- apparently only a single bottle was loaded, and once welcome drinks were served that was it! 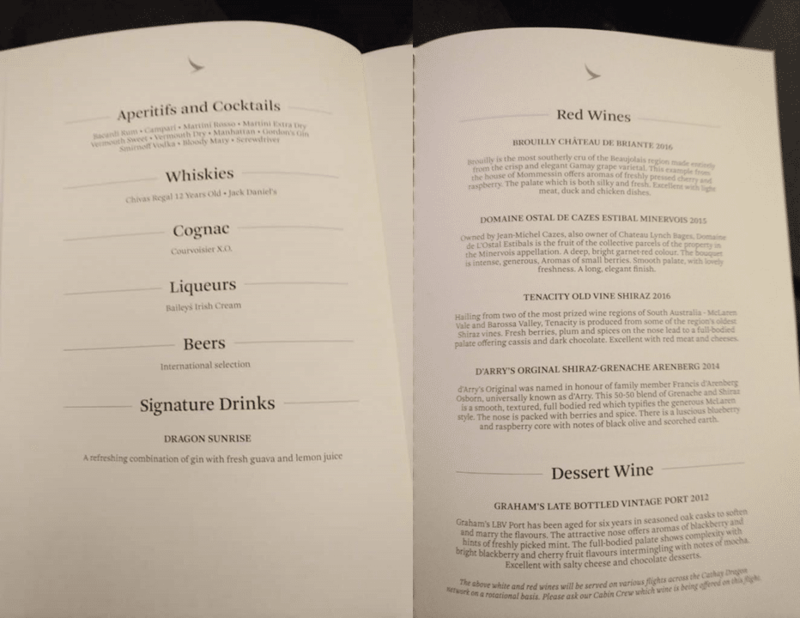 No such issues on Cathay Dragon, where the Piper Heidsieck kept flowing. 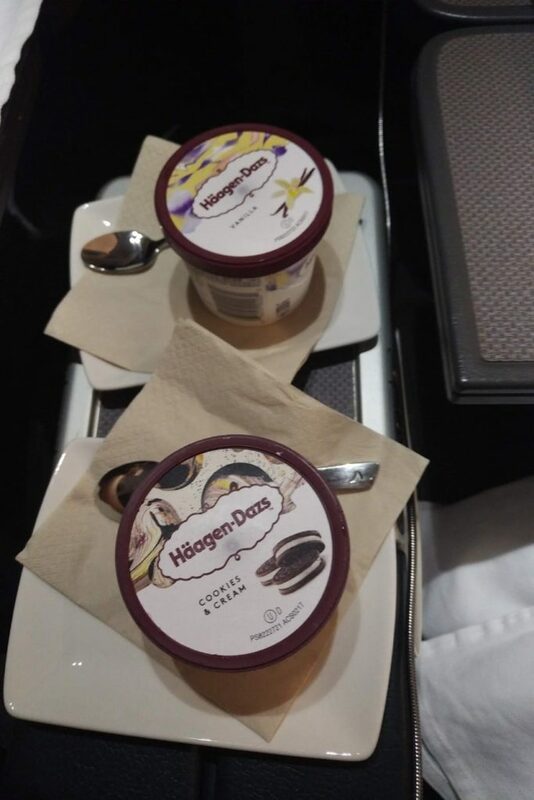 For dessert we were offered a choice of Haagen-Dazs ice cream: vanilla or cookies and cream. 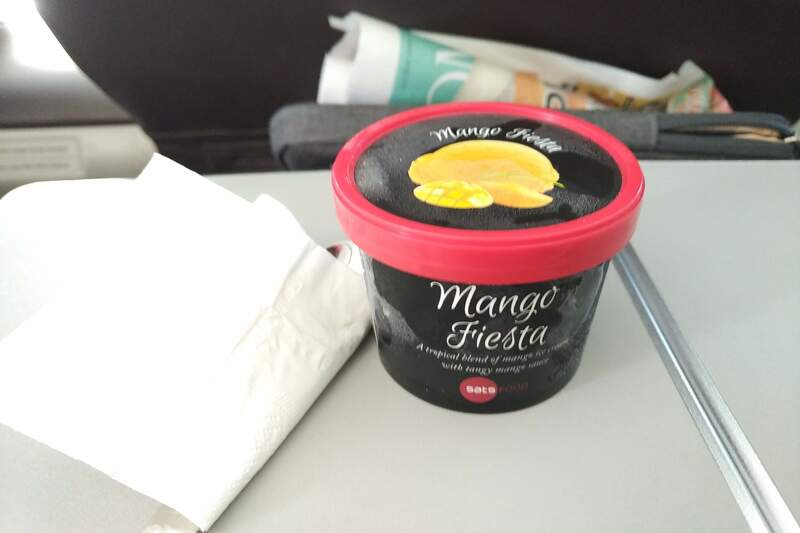 This was a much better option than the awful SATS ice cream served on SilkAir. I don’t care what you say, Mango Fiesta from SATS is not haute cuisine. 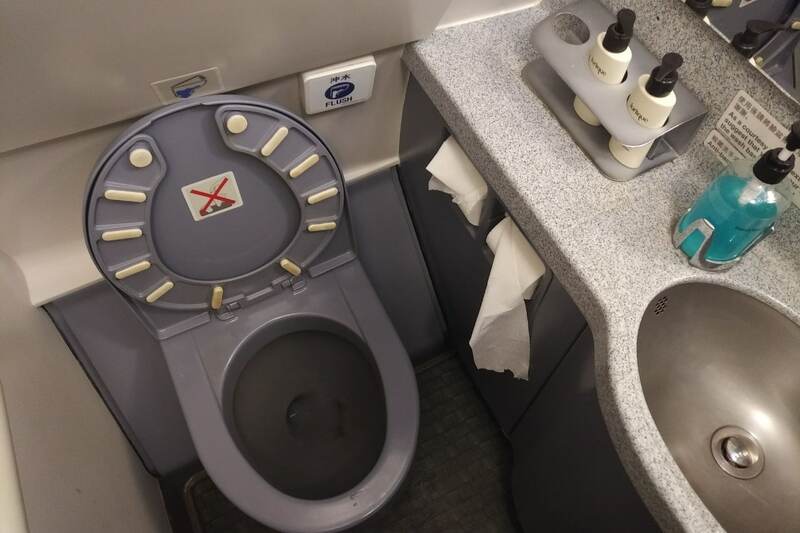 I checked out the loo before we landed, and it was clean and well-kept. Jurlique amenities were available. 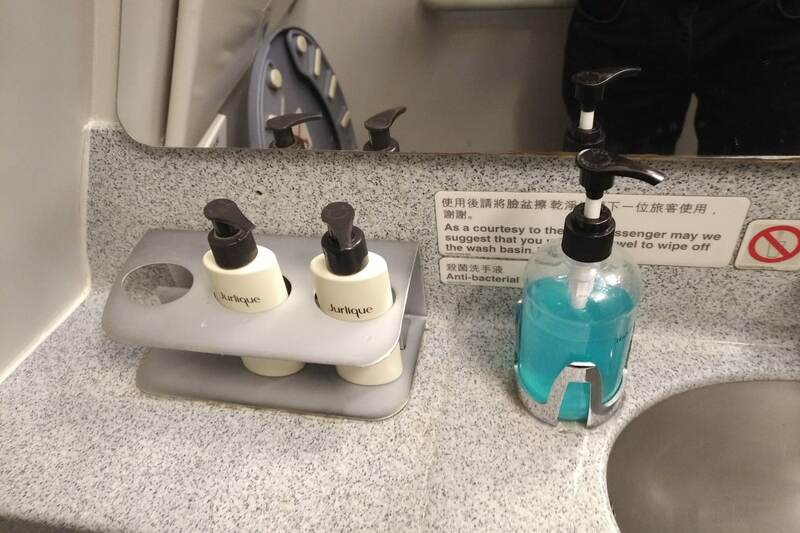 SilkAir, unfortunately, doesn’t follow the lead of SQ in having Penhaligon’s bathroom amenities. They just use a generic brand. 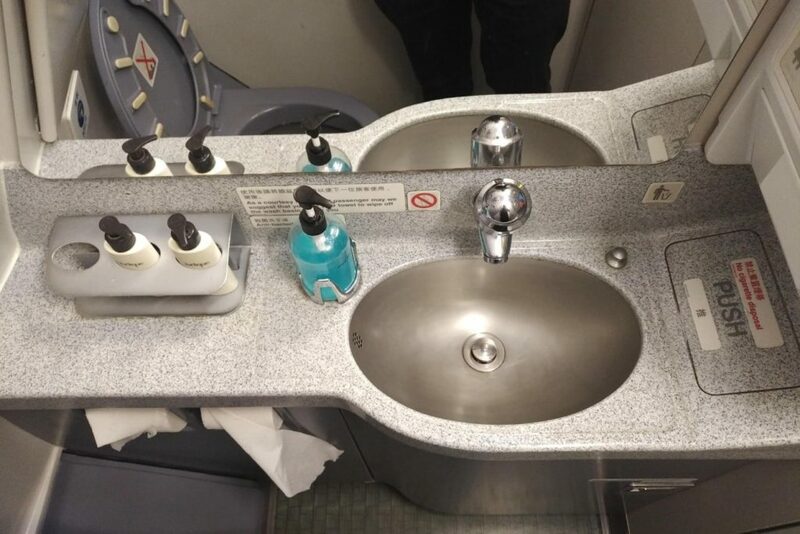 I was pleasantly surprised by the Cathay Dragon experience. 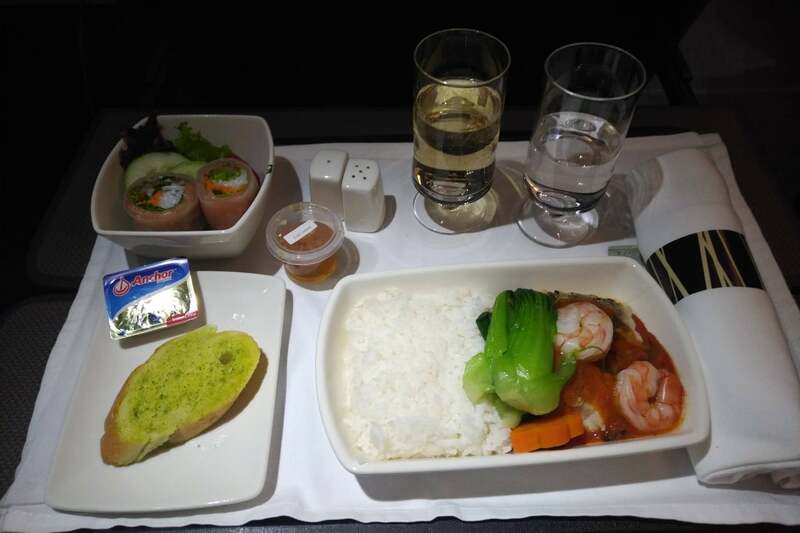 Even though the flight was barely two hours, we received a modern seat and a good meal (the absence of a champagne crisis was a bonus). 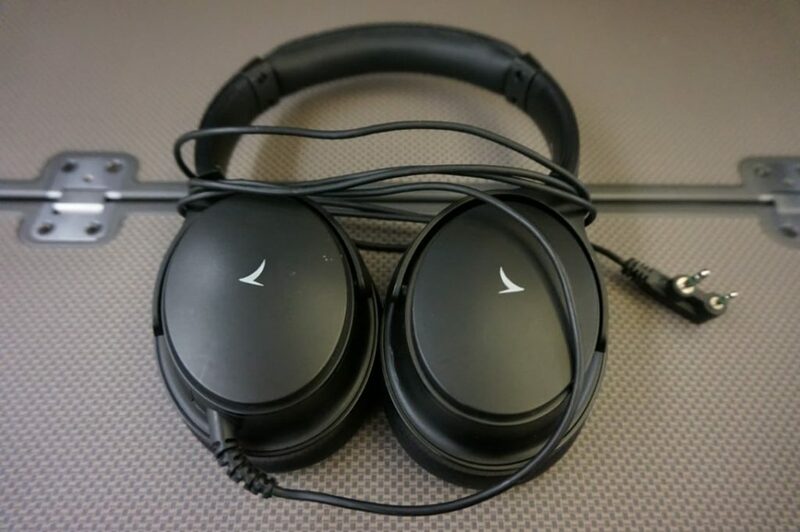 Compared to my experience with SilkAir on SIN-HAN, Cathay Dragon was way superior. One can only hope this will change once SilkAir is fully absorbed into SIA. Not only does Silk Air only stock one bottle of champagne on some flights, it’s a 375ml bottle. Quite shameful considering how much they charge for those flights. 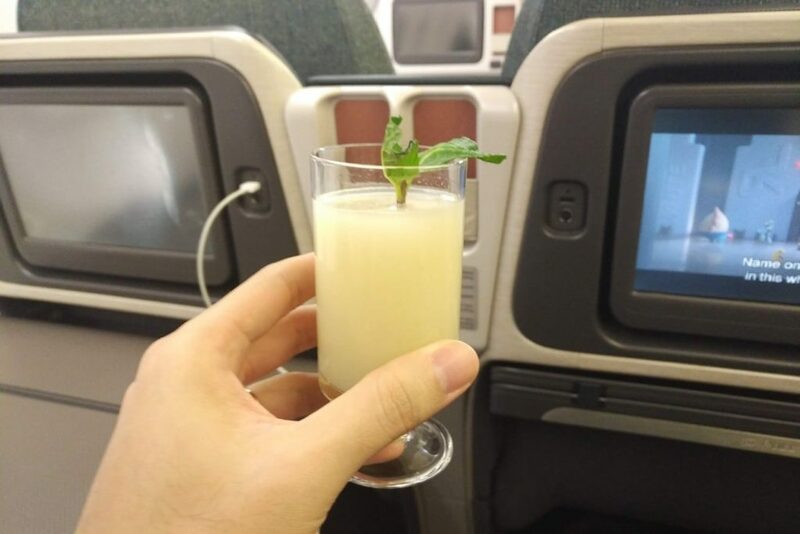 Though, not as shameful as the fact that they don’t even stock any champagne on shorter flights. Now that you mention it, I deeply suspect my flight may have had a 375ml bottle because it disappeared way too fast. Wow, HD ice cream. Some of my SIA business don’t even serve that. I’ll take HD/Ice cream over a cream dessert or ice jelly. Ice cream makes everyone happy and SQ shouldn’t try to save costs in that aspect. 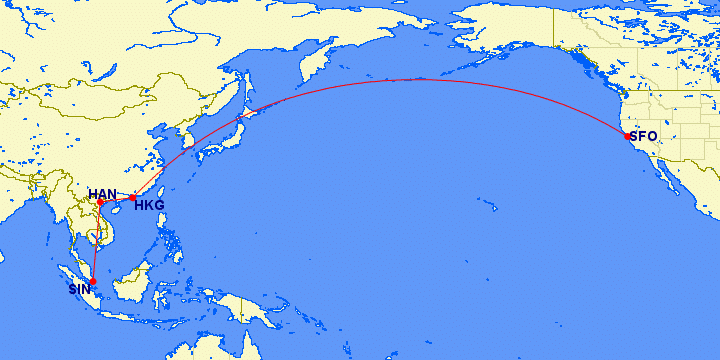 Curious on how you already had the onward boarding passes for HAN-HKG. Assume it’s because CX lets you print your boarding pass online and HAN transit security is fine with self printed boarding passes? But what did you do with your luggage? You’d have to collect and check in again at Hanoi? Hi, curoius to know which program you credit the miles to for this leg?